-10- This is a huge sculpture carved by the Olmeca Indians of Mexico. Esta cabeza pertence a las tribus Mexicanas conocidas como Olmecas. Es muy grand y pesa algunas toneladas fue tallada a mano. 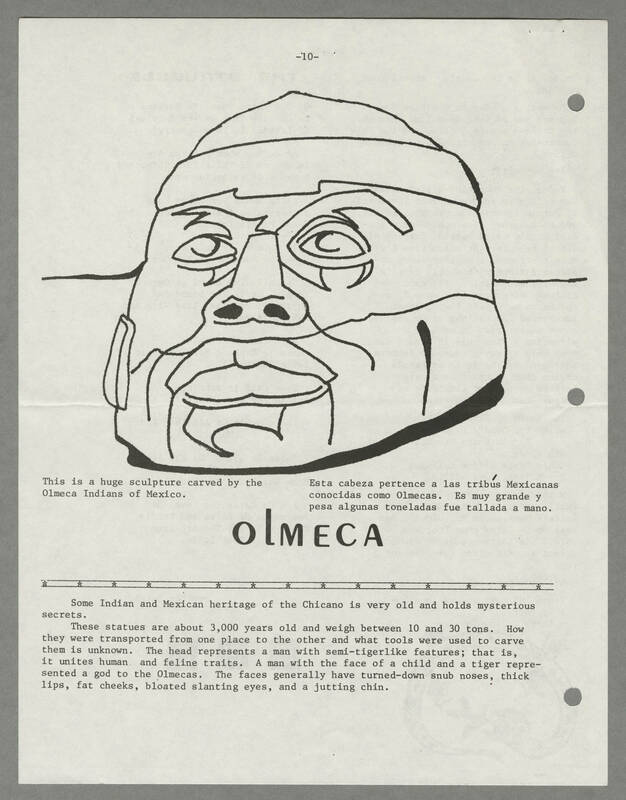 Olmeca Some Indian and Mexican heritage of the Chicano is very old and holds mysterious secrets. These statues are about 3,000 years old and weigh between 10 and 30 tons. How they were transported from one place to the other and what tools were used to carve them is unknown. The head represents a man with semi-tigerlike features; that is, it unites human and feline traits. A man with the face of a child and a tiger represented a god to the Olmecas. The faces generally have turned-down snub noses, thick lips, fat cheeks, bloated slanting eyes, and a jutting chin.